Forum Preview extension shows Last Post and Image Preview on Joomla Kunena, vBulletin, Invision board, Social Strata, Fudforum, Google Groups and phpBB based discussion forums. Top Comment preview on Reddit. 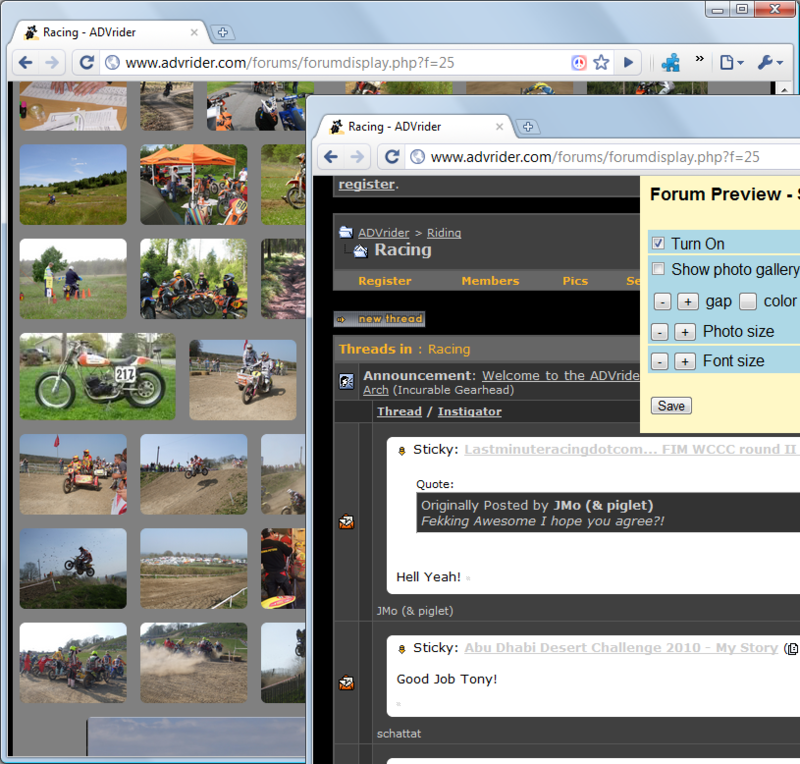 In Photo Gallery mode the Forum Preview will construct an Image Gallery on top of forum listing page. Be the first to make a post on your favorite discussion forum and inform other members and friends about this Forum Preview Extension. Requirement : Recent or sufficiently fast computer with fast internet connection. Safari : in the works, coming soon. NOTE: If people like this then I will add support for other forum software too. Photo gallery from threads. Custom settings for Gallery. My Gallery (chrome only). Slide show. Force show new Posts and new Replies. Hide (fold) all posts. Quick toggle fold posts. YouTube – Top Comments under embedded player in forum. (Chrome only, vBulletin). Working on separate extension for this. That will work on all sites. Quick Delete of your post in vBulletin 4+ (Chrome only). Note: Some of the above features are for vBulletin 3.x boards only. Added “Todays Posts” link on vBulletin 4 when signed in. vBulletin 4 (alpha). Click peace icon to open and change Forum Preview Settings. Original Concept. Action buttons, info panels and menus near top and on right edge of screen. Few years back I added new posts information box, easy (un-)fold posts controls near right-top edge for easy access. It seems that location and concept has picked up and lot of new sites are placing all kinds of menu or control options in that location (Area from top-right corner to [1/4 x screen-height] distance from top and on right edge). This is also used in my other popular extension Craigslist-Peek. Avatar Effects: Works for vBulletin boards, when using Google Chrome (Firefox not supported at the moment) and have this Extension installed on it. See screenshot and See avatars p.l.a.y here. Leave a comment below if you need to create similar Avatar. Probably you will have to email me your Avatar image and link of the YouTube video. Follow these steps (on Windows computer) to modify your Avatar to add YouTube video. Here ‘zuCjHXLHGUk’ is video code that you can extract from YouTube video address. That’s it upload originalAvatar.png to your vBulletin Forum and see if it worked. If the steps didn’t worked for you then just leave me comment and maybe I can do it for you. Switch Forum Style. If it stops working on forum (e.g. vBulletin) then see if the forum allows you to change style(usually drop down style list is located at bottom of page). Try changing style. Forum Preview extension shows last post, photo gallery on listing page. Shows last post under titles with Forum Preview extension. Forum Preview extension showing Settings popup. 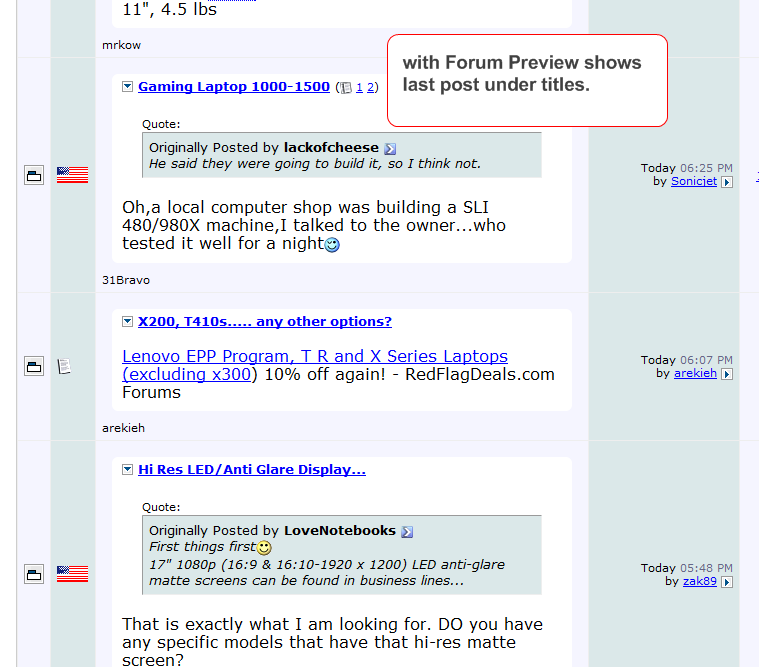 Forum preview extension showing Last Post inline on listing page. Forum Preview extension showing regular listing in bottom and the generated Photo Gallery on top. Shows titles only without Forum Preview extension. Shows last post under titles with Forum Preview extension. Basically Expands the listing page to show most recent posts. Forum Preview Extension showing Auto check New Posts / Replies on Naruto Viz. YouTube Top Comment preview in vbulletin Forum with Forum Preview Extension. * Added to Google Extension gallery.